Most of the farmers' markets are ending this week. A few - Green City and Logan Square - move indoors for the winter. 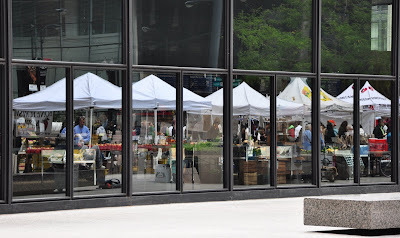 This is the Tuesday Federal Plaza Market, as reflected in the nearby Post Office. That has to be a great thing for city dwellers. Good work, you've captured Chicago to a tea! It Looked Better on Paper?